Toilets to Remain Open – Yesssss! OK It’s official – the park toilets will remain open over the winter. Our thanks to everyone who contacted the council and let their feelings be known. You know who you are. Let’s explain how the toilets will remain open and you will see how hard it has been to negotiate this result. Huge thanks are due to Joy and the Sandall Park Cafe and staff. The cafe will fund all the costs for consumable items over the winter. The staff will also lock up the toilets daily – as they have done throughout the summer. Without this help the toilets would certainly remain closed. The council grounds team will open the toilets daily and mop them out – when they come to the park to empty the litter bins. 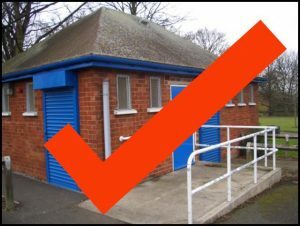 Friends of Sandall Park volunteers will give the toilets a clean and keep them stocked up. We will also monitor the toilets during frosty periods and will drain and close the toilets if there is a chance of frost damage. THIS IS IMPORTANT AS THERE IS NO/LITTLE MONEY TO CARRY OUT EXPENSIVE REPAIRS. The toilets may open a little later in the morning than in the summer and will be closed before it gets dark. Our thanks to everyone who supported us in this short but ultimately effective and succesful campaign.